I recently read a wonderful article written by Toni Bernhard for Psychology Today. The article: Another Blow to Chronic Fatigue Sufferers. According to the American Academy of Family Physicians in a new Patient Information sheet, those with Chronic Fatigue Syndrome are just suffering from a disorder that causes them to be very tired. So to those of you out there that have been diagnosed with and suffer from Chronic Fatigue Syndrome, are you just very tired? Or are you tired to the core, unable to function, suffer debilitating fatigue or wake up as tired as you were when you went to bed? I think the American Academy of Family Physicians has done a huge disservice to all of us suffering from Chronic Fatigue. I have been diagnosed with this syndrome and do wake up many days unrefreshed. I do have days when my legs and arms are achey and tired. Some days I would love to just crawl back into bed and rest but force myself to keep moving sometimes until I just hit the wall. My problem is that I feel ok and then do more than my body wants to do and pay the price later. I am trying to be better about managing my energy but when I have it I feel like I did before I became ill and it feels so good to just keep doing. This entry was posted in Chronic Illness and Treatment, Depression, Environmental Illness, Multiple Chemical Sensitivity, Uncategorized and tagged acute allergies, Chronic Fatigue Syndrome, chronic illness, depression, environmental illness, How to be Sick, isolation, multiple chemical sensitivity, survivor. Bookmark the permalink. This blog will help so many!!! Great insights!!! Thank you for posting. It didn’t show up right away because I have my blog set up for the first comment to be approved by me. My blog address didn’t show up right on the last comment so am reposting…. A lot of their information shows an overlap between many illnesses: fibromyalgia, ME, Chronic Fatigue Syndrome, MCS, and chemical sensitivities. There are only about five places for us to get helpful information over here. You are lucky to have so much over there. I can’t imagine how hard it is for you with all you’ve had to deal with. 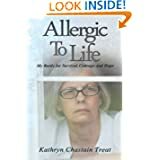 I don’t have CFS but I can get really tired (almost in a stupor, and unable to connect my thoughts at all) after being in a room with spray deodorants. I think the mask makes it worse though, because I might stay in the room longer than if I didn’t have it on. Thank you for sharing. I understand how the mask can give a false sense of security. Even with the mask I know if I have been somewhere too long because the brain fog and inability to function sets in signalling that I need to flee or else. I’m only just working this part out. It seems that when I my forehead has a tight feeling, like a rubber band across it and my temples, then it may be time to flee. Do you get any type of signal? For mold? Immediately I get into a state where I can hear a person’s conversation with me and even formulate an answer but my brain get screwed up and I can’t relay the answer I have formulated. That is a major sign for me. But I also get an immediate buzzing in my head, tightness in my throat and chest, lose my voice, and even begin to get a tremor in the right side of my body starting with my right hand. I have also experienced where I know there is something wrong but the part of my brain shuts down that tells me to flee. One incident I can tell you is when I was in Dallas. A friend and I were trying to visit someone in their condo. We had made an agreement that if either of us didn’t feel well, we would leave immediately. So we walk in and the person living there asks how we are doing, I go to talk and my voice is almost gone. I knew I couldn’t be in there but I just froze. I couldn’t get myself to move out of there. Fortunately my friend grabbed me and took me outside. By that time I was beginning to go into tremors and coughing violently. It is so strange how we all react differently. I have a friend who immediately gets indigestion and starts burping around mold. Some that I know get a lead pencil taste in their mouths. My dad used to say don’t judge a man till you walk a mile in his moccasins. Don’t you sometimes wish people who judge could just be afflicted with your symptoms for just one day? There are many times when I get tired and have to go lay down, then while laying there think I feel better, I’ll go throw in a load of laundry, do dishes, cook, etc. By the time I go to the bathroom and wash my hands I’m so tired I literally can’t get one foot in front of the other. I have always said that I wouldn’t wish this on my worst enemy. However, I would like those that don’t believe this illness exists or those that don’t try to understand it could walk a week or two maybe even a month in my shoes and live my life. Then maybe, just maybe, they would understand or have compassion. Thank you for reading my blog posts and for sharing with us. I’ve long wished for an “Empathy Machine” that you could plug into your brain and into your doctor’s. I’ll bet they’d get a lot of illnesses that they don’t understand right now. I don’t want to make people suffer, just wake them up, and dramatically if necessary! I have been fortunate with the exception of the workers’ comp doctors I was sent to by my employer’s defense team to have very empathetic doctors. My doctors are wonderful. But I hear stories all the time about those dealing with the kinds of doctors the defense team sent me to. I plan on commenting more about those appointments in upcoming posts. Exactly! One minute things for me seem ok and the next I am totally out of energy. That is why I love the Spoon Theory. It really explains what happens when you use up your entire day’s worth of spoons and possibly the next day’s as well. I used more than my allotment of spoons yesterday and today I have a huge list of things I really need to get done and a major headache. I am setting the timer on the stove for 30 minute increments and do something physical and then sit and do something requiring less energy to get myself through the day.